Teapot. Fabric, beads, sequins, thread and embroidery. Bead Embroidery on silk noil using size 15 Japanese seed beads. Oxidized silver 950, fine gold, 18k white gold. Keum-Boo technique. Sweater Cotton, hand dyed and painted, knitted, crocheted, embroidered cotton threads, glass seed beads, nylon beading thread. Flowers: Pennywort, Iris, Spearwort, Forget Me Not, Golden Alexanders, Painted fern, Liverwort, Swamp Smartweed. Necklace. 18th-19th century, made in Venice for Africa, slices 24k gold, fastener 900 gold. Inside golden fox tale. Polymer clay carved beads, mosaic inlay, mokume gane, glass beads by Dan Adams, sterling silver bezels and clasps. Neckpiece. Glass beads, beading thread. Off-loom bead weaving, peyote and free form stitch. Oxidized silver, 18k gold, found barnacles. Teapot. 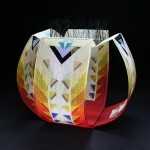 glass beads, thread, foundation fiber, archival board and micro-suede/Sculptural peyote and 2-needle couching stitches. Teapot. Bead embroidery and sculptural peyote stitch. Glass beads. Necklace / Pins. Bead embroidery/Glass beads, thread, ultrasuede, snaps and pin backs. Jeanette Ahlgren weaves colorful, luminous glass beads into structures inspired by landscapes and Native American textiles. Capturing and refracting light with ethereal and glowing forms. The use of glass seed beads allows her to explore the purity and strength of color as well as the combination of different colors. According to Ahlgren, the presence of low-intensity colors in her work, called Theory of Life, forces the viewer to look at the bright colors. The artist applies a method she calls the random dot bleed pattern, which allows her to create works with an air-brushed effect. Ahlgren’s work has appeared in exhibitions in the US and abroad, including Japan, Denmark and France. Her work is in the collection of Museum of Art and Design, New York and the Museum of Fine Arts, Boston. Inspired by fairytales, mythology, and children’s stories, Amy Clarke Moore creates photo-realistic images from her everyday life with bead embroidery by stitching size 15 Japanese seed beads to silk noil in a spiraling backstitch. "Stitching down tiny beads, I draw images from my everyday life and allude to the mythology and fairytales that I read as a child and that now inhabit my dreams. I shot the photograph behind this image in 1989 when I visited Egypt with my family. We were touring a carpet (kilim) making factory in Fowa, Egypt, and this woman was taking her lunch break. She was sitting on the enormous pile of wool that she was teasing by hand in preparation for carding. She stopped eating to demonstrate the process and allow me to take a photo. I love the expression on her face. I added the bird using collage techniques (by printing and sewing the paper in place) because I had the Emily Dickinson poem 'Hope is the thing with feathers that perches in the soul . . .' in mind for this piece." 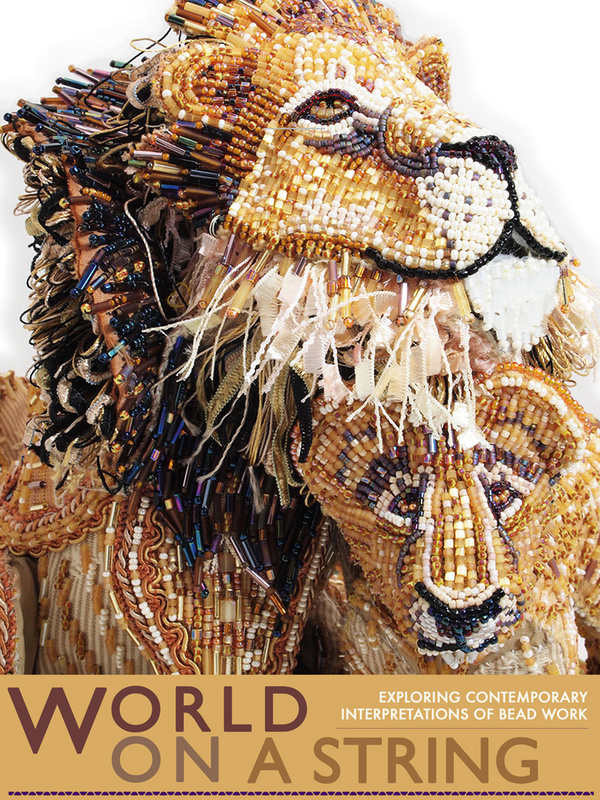 World On A String features Bodacious Beadwork by the “Queen of Beads” Joyce J. Scott Award winner of The Lifetime Achievement Award, 2017, The Glass Art Society and The MacArthur Genius Award 2016. Arata Fuchi is a graduate of Tokyo Zokei University where he studied industrial design. He perfected his metal smithing skills at La Arte Orafe, (the Italian school dedicated to contemporary jewelry) receiving accreditation as a recognized goldsmith. Inventing a technique he called pulverization, which he often incorporates in his work, Fuchi continues to experiment and push the boundaries of what is possible in the field of studio jewelry.His necklace Amorphous Core illustrates Keum-Boo, another technique that Arata Fuchi has redeveloped and redefined. Keum-Boo is an ancient Korean gilding technique used to apply thin sheets of gold to silver. Accomplished by first depleting the surface of sterling silver to bring up a thin layer of fine silver. Then Arata Fuchi slices minute, thin strips of 24k gold foil which is then applied to thin wires of silver with heat and pressure.Then each formed gold sphere is fabricated to fit inside masterfully constructed oxidized silver frames. "I like to tell stories. In a way my fiber work is about telling stories. Sometimes they are stories that attempt to translate a particular piece of the natural world, sometimes myths and legends, sometimes stories about stories. I also love the natural world—the habits of insects, reptiles, and amphibians; the multifarious forms of plants; and the small but miraculous one-time phenomena that occur every moment around us. The difficult problem of the translation of the exact textures and colors of the natural moment into an image made of fiber is fascinating to me. In my jackets, I am reporting on some of the daily phenomena that I have witnessed in the world around me—butterflies in the mist, the surprising beauty of a spider’s web, light and shadow in a field, the lively round of life and death in the pond." "In 1986 my husband, Dan Adams, and I came across The History of Beads by Lois Dubin and began collecting beads in earnest. We started making beads and later jewelry to pay for our bead addiction. In 1986, while I was visiting my sisters in Hong Kong, they introduced me to polymer clay, and I have been working with it ever since. Most of what I do is trial and error, spending long hours with the material. My work is technically simple but very labor-intensive. Most of the pieces are figurative; they may be inspired by events or the title of a show or color combinations or an inspiring museum exhibition. What I make is what interests me at the moment, and even though some pieces involve a bit of research, the result is still my own drawing style." "I consider myself the "Grandma Moses" of the beading world. Standing squarely with one foot in the folk art world, and one foot in the world of modern art, I am determined to demonstrate that beading, which we all know can be a wonderfully rich decorative medium, can also be an expressive art form. Instead of mending socks, I spend my days trying to bend needles around curves, breaking 100s of them in the process, turning the air blue. All this, because my sculptural beading strives to provide the viewer with a rich, tactile uniquely beaded imagery. An imagery full of textures and directional clues such that a visual beaded journey, no matter where one begins in one of my beaded pieces, can be as rewarding when experienced as beaded abstract expressionism, as the journey of following the storyline of the images. The experienced viewer will also recognize the interweaving or blending of cubist with expressionistic elements as they follow the beaded stepping stones though my pieces. Chagall having tea with me symbolizes the transfer of inspiration. He has brought some of his favorite elements, which I interpret in my way - reflecting somewhat his cubist period." Felieke van der Leest is a trained metalsmith, graduating from the jewellery department at the Rietveld Academie (The Netherlands) in 1996. Living close to a Zoo, her passion for animals probably started in her childhood just like her love for crocheting in textiles. Combining this with precious metals and plastic toy animals, she developed her own idiom in contemporary jewellery and art objects. 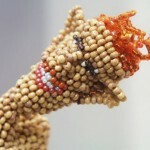 Her works are best described as portable miniature sculptures; rich in humorous language. Although Felieke's animals are mostly comical at first sight, the story they tell is never childish of frivolous. By combining contrasting materials like plastic and precious metals, Van der Leest gives her animals a different identity and context. Her work expresses the very special affection that she has for animals. Public Collections include: CODA Museum, Apeldoorn, the Netherlands; Hiko Mizuno Collection, Tokyo, Japan; Museum of Decorative Arts, Montreal, Canada; Museum of Modern Art, Arnhem, the Netherlands; National Museums Scotland, Edinburgh; Rijksmuseum Amsterdam, Amsterdam, the Netherlands; Victoria & Albert Museum, London. David Chatt is a sculptural glass bead artist. He creates vessels, sculptures and other curiosities by hand sewing glass beads using a right angle weave stitch that he adapted. He received his BA from Western Washington University, Bellingham and studied at Pilchuck Glass School. His work can be found in the collection of the Bead Museum, Racine Art Museum, Museum of Arts and Design, Tacoma Art Museum and Museum of Fine Arts, Boston. 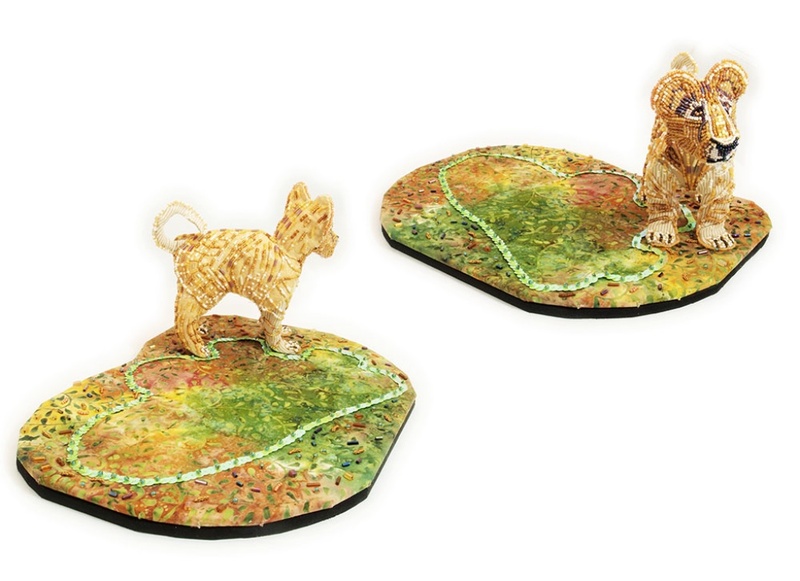 Inspired by the artwork of Henri Rousseau, a French painter whose best known paintings were of jungle scenes. Inspired by the colourful costumes and textiles of Mexico. These three neckpieces are inspired by the designs from the Mexican regions of Guerrero, Oaxaca and Puebla, as the names imply. Each area has its own distinct design. In the Guerrero region, textile designs tend to be in horizontal bands heavily embroidered on loom woven fabrics. With reference to the neckpiece “Oaxaca”, the beadwork design is based on traditional dresses worn by Oaxacan women. Frida Kahlo, the famous painter, frequently wore this style of dress. Typical of Puebla region is fabric in a neutral colour, embroidered in bright colours with flora and fauna in a whimsical style. "Varied expressions that plants show us. Green leaves that wave in the breeze and shine. Soft tones that autumn leaves raise by touching each other. Happiness that you would feel when you touch a flower. Scenes of nature give me pleasure. I am aiming to create the jewellery, with which you would feel being in conversations with tress and flowers." Jose Marin is a talented self-taught metalsmith; he chooses to work in titanium, the element discovered in Cornwall, England and named after the Titans of Greek mythology. "These beadwork wall pockets depict the uniquely Alaskan scene of dip netting, people standing in the river, hauling their nets out with the sparkling salmon, kids, dogs, trucks, tents, coolers, and lots of excited sea gulls. I’m an Alaskan artist who has been creating beadwork, using primarily the bead embroidery technique for over 40 years. I portray and interpret the world around me using nature as my main inspiration. The life of a full time beader gives me a unique perspective. The small intricacies of the direction to lay the beads, the way to combining of colors, and the use of the black line is something that I’ve perfected over time. When you spend as many hours as I do, you understand that there is a state of flow you can reach in your creativity just by the act of doing and I thrive on that feeling." b. United Kingdom. Kaz Robertson received her BFA from Edinburgh College of Art. Mainly working with resin, she fabricates pieces by combining a bold color palette with patterns. “Interaction and versatility are two of the most important aspects of my work. I like the wearer to be able to play with my jewellery creating new pieces. Setting magnets within the resin provides a way of changing each piece easily. Ring tops can be swapped, bangles stick together and neckpieces interconnect. "Life Desaturated, is my second life-sized squirrel sculpture. He took roughly five months to complete and was worked in glass beads using a traditional Native American technique called peyote stitch, over a dense foam core. The sculpture title, in part, reflects my ongoing determination to try to think that life is funny...which sometimes helps me to keep things in perspective. In this case, I was trying to illustrate a sense of hope for the future, as this little fellow moves from a world lacking in color towards a poly-chrome existence. Nope, I’m not depressed, just a realist whom also attempts to remain optimistic!" "In my work I am inspired by botanical nature and landscapes and I am interested in representations of the four seasons. During the last fifteen years I developed a unique technique using thermoplastics such as PE (Polyethylen) and PMMA (Acrylic). This technique is the basis for my research into form, colour and structure. The new necklaces which I made for Mobilia Gallery for the ‘World on a string’ show consist of pressed Polyethylen(PE)-discs. Each of them is made seperately: coloured PE-granules and threads are arranged in a kind of minicollage. By heating and pressing the collage, the loose elements merge into one piece to create very light and flexible forms. I do not use templates: the contour and pattern of these forms are created by the impact of pressure. This becomes especially visible in disc-forms because the colour spreads out and ‘explodes’. After completing the discs they are connected with each other by silver loops. To me a necklace is a unity, a closed circle where each single part communicates with the next. With this new kind of joining the PE- forms the individual pieces become more visible in comparison to the dense, layered ‘tooien’-colliers, and I can therefore work more directly on colour and composition." "The mediums I work with have a historical connection and fascination for me. 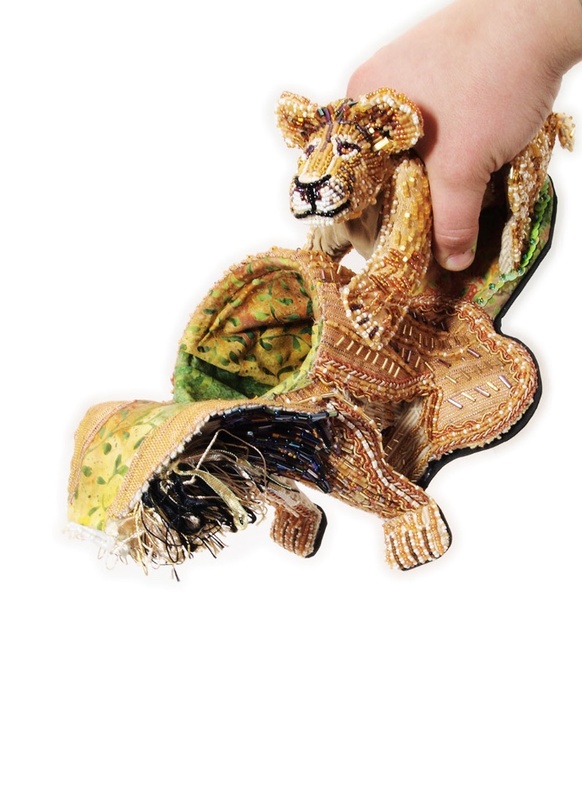 The felt, beads, paper and paint give me an enormous sense of pride because not only have they been used for centuries but there has been no adequate synthetic replacement for them and they continue to hold a universal fascination and tactile relationship to many. The fact that felt, beads and paper are from this earth and recyclable is just an added bonus.My current work is an exploration of techniques as well as expanding my range of subjects and knowledge of the natural world. There is after all a state of enchantment when we feel the invisible thread between us and art and nature." “Greetings from Alaska!” idealizes the tourist experience in Alaska. It features the many animals that visitors hope to see when they come to our beautiful state—except for sea gulls, which just happen to be everywhere! The bear handle was created with a sculptural peyote stitch. 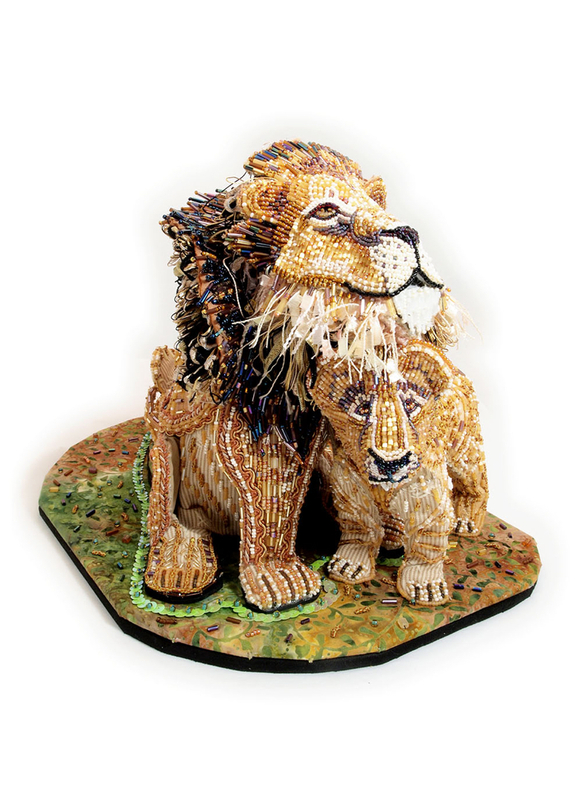 A unique characteristic of this technique is that there is no underlying armature—it is formed using only beads and thread under tension. I am exploring how all earthly things are connected, even by the smallest of threads and how we humans can, willfully or unwittingly, alter those connections. My craftwork illuminates the beauty and fragility of the natural world, and the effects of human action on Alaska’s animals and the people who rely on them. Much of the wildlife depicted in my work is a source of food and vital materials in the subsistence culture of Alaska Natives—a culture that has relied on the balance of nature for survival time out of mind. Linda Dolack has spent her professional lifetime combining humor and visual exaggeration as a means of celebrating contemporary popular culture. For the past decade, she has focused her lens primarily on food, both necessary and central to all human existence. 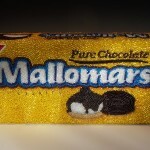 Dolack points her finger specifically at the most heavily marketed, highly coveted ‘junk’ foods as well as other commodities found in grocery stores that foster comfort and communal desire. "My work introduces unconventional use of familiar artifacts into a world full of conventions. By assembling, grouping, clustering, and piling, the small and simple elements become complex, and give rise to the unexpected. As the wearer approaches my work, the experience of perspective shifts and sudden realizations spark wonder, discovery, tension, joy and play. My investigation of creation, innovation, and transformation questions the definition of value, and provides a never-ending field for invention." 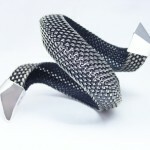 Yong Joo Kim received her BFA from Sook Myung Women’s University in Seoul, Korea and her MFA in Jewelry and Metalsmith from Rhode Island School of Design. She received Fellowship awards from both universities for her achievements in craft and metalsmithing. Her work is held in the permanent collection of the Museum of Arts and Design in New York. and micro-suede/Sculptural peyote and 2-needle couching stitches. Beads have a rich tradition and history, the oldest bead discovered dates to 108,000 b.c. Throughout the ages, beads have been used for barter, currency, and as the “world’s first form of adornment.” The humble bead can be made of glass or wood, of plastic, crystal or even barnacles. And it can be shaped into mosaics, necklaces, teapots and other countless creative and sculptural forms. The below images are a partial listing of the participating artists.